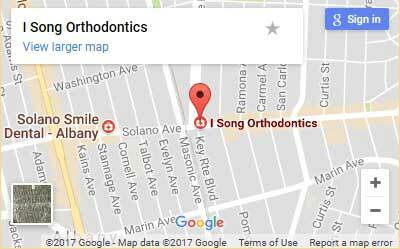 At I Song Orthodontics, we’re committed to delivering exceptional care to patients of all ages in Berkeley, El Cerrito, Oakland and the surrounding areas. With over twenty years of experience, Dr. Immi Song and her team are dedicated to providing unmatched care and amazing results to every patient. By using the latest in orthodontic technology, including Invisalign, we can ensure that your treatment is both efficient and effective. We’re here to help you achieve your most beautiful smile. Prepayment – When full payment is made at the beginning of treatment, a discount of 3% for credit cards and 5% for cash or check will be applied. Monthly Installments – A down payment followed by interest-free monthly payments. VISA and MasterCard are accepted. Insurance – We are a preferred provider for Delta Dental Premier and accept most PPO plans. We can help you determine what coverage you have available and file for the benefits at the beginning of your treatment plan. Third-Party Financing – We have partnered with Springstone Financing which offers a flexible payment plan with no down payment and no prepay penalties. Apply in our office or visit their online application.